A reckoning is coming. After months of ban mania, speculation, theorycrafting, and general rage against the Wizards machine, the January 18, 2016 banlist update will decide if Amulet Bloom is an acceptable Modern deck. Many authors players have vehemently opposed the combo strategy since Justin Cohen’s February run at Pro Tour Fate Reforged. Others, including the DCI, were more moderate. In the months following February, there have been three banlist updates. All resulted in a resounding “No Changes” despite the frenzied pleas of ban-hungry masses. I correctly predicted and praised Wizards’ conservative approach those cases, defending their assessment of Modern health and their execution of the ban policy. The time for inaction, however, has passed. Today, I will present evidence that Amulet Bloom violates the turn four rule, and agree the time has come to ban one of its staples. Whether you are a Modern Nexus veteran, or a newcomer who is either thrilled or furious that I’m targeting an article at this deck, know that I have not come to this position lightly. Indeed, I’ve spent most of 2015 shielding Amulet Bloom from criticism, both here and throughout the online Modern community. That changed when I finished the analysis that I conducted for this article. There is now enough data for me to demonstrate the deck legitimately breaks the turn four rule. This is not kneejerk alarmism to Bobby Fortanely’s StarCityGames Cincinnati win. I’m not salty from losing packs at Friday Night Magic, or boarding a ban mania hype train because it’s popular. Rather, I’ve crunched the numbers and concluded that Amulet Bloom is a turn four rule violator in need of banhammering. Read on to see the evidence that led me to this conclusion. We’re going to start with the loudest and most obvious evidence in favor of an Amulet Bloom ban: the overwhelming player, author, and pro outcry against Bloom decks. To be clear, I don’t think Wizards listens to the masses alone. If they did, Bloom and even Goryo’s Vengeance would have been banned in the July announcement. 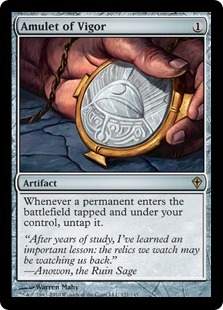 Maybe even the March update, in the case of Amulet after Justin Cohen’s explosive finish at Pro Tour Fate Reforged. That said, we know Wizards is aware of banlist buzz, and we’ve heard ample anecdotal evidence to suggest they at least consider it when making decisions. This means we should account for such qualitative evidence too, even if only as a single datapoint in a larger picture. It’s hard to find widely publicized sources that don’t want Bloom banned. Prime Time specialist Chris VanMeter went on the record to state the deck was unhealthy for the format, largely as a function of its speed. Seth Manfield agreed, explaining that Bloom probably wasn’t too powerful for Modern per se, but that it leads to a problematic kind of Magic which Wizards probably discourages. 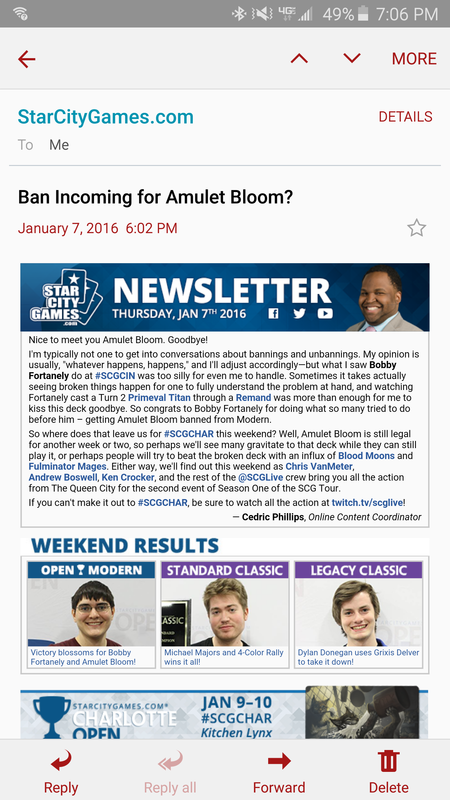 StarCityGames also doubled down on Bloom ban talk in its Thursday, January 7th newsletter, with Cedric Phillips either predicting the deck’s death or (get on those tinfoil hats!) hinting at some insider knowledge. Perhaps most notably, these opinions were shared by Bobby Fortanely, the SCG Cincinnati winner whose Amulet Bloom finish kicked off the 2016 discussion. Bobby says the deck is too good, too fast, and overall bad for the format, a line of thought echoed by fellow Top 8er Bill Comminos in his comments on r/spikes. Bobby and Bill were by no means the only Open players to fall on those lines. Seven out of eight players in the Charlotte Top 8 also want a Bloom card banned. In case it wasn’t clear, I don’t place too much stock in these kinds of opinions alone. To be sure, stances like Bobby’s are likely grounded in actual testing. Others, notably anything spouted by the average Twitch chatter or forumgoer, come from a place of hype and ban mania. They also don’t cite a whole lot of sources, which is a degree of subjectivity that makes them hard to argue for or argue against. This isn’t to say subjective, qualitative evidence is “wrong”. It is just to acknowledge that we might have different experiences with a deck, all of which could even be “right” within those isolated experiential spheres. That’s why I emphasize using qualitative data as just one piece in the overall puzzle. Given Wizards’ conservative approach to the banlist in past years, I suspect they feel the same way. Popular media should be treated as a single source of data in larger calculations. So long as we maintain this critical lens, we can leverage opinion pieces to triangulate harder numbers at the core of both my own stance and Wizards’ actions. Opinion pieces are fun and can attract a lot of attention, but many vocal ban proponents often lack (or ignore) the hard evidence underlying their sermons. Following this, it is impossible to have a coherent conversation about Amulet Bloom without understanding Wizards’ turn four rule to the best of our ability. I specify “best of our ability” because Wizards has only provided so much concrete evidence on the rule (or any banlist policies) since the format’s birth. This lack of communication, a larger issue to address another time, leads to incessant ban speculation, panic, and misunderstanding: we just don’t have a lot of information to work from. Conditions like this force Moderners to piece together what little evidence we do have, like Constitutional scholars scouring the Founding Fathers’ documents for clues about the Second Amendment’s intent. Does this mean we shouldn’t try to gather the evidence at all? Certainly not. It just underscores the importance of carefully analyzing existing sources before we can predict and understand Wizards’ decisions. If you haven’t read my “Understanding the Turn Four Rule” article, do that now before going any further. As far as I have found, this is the most accurate single source that compiles Wizards’ turn four rule information and synthesizes it into one definition. The article includes the language we need to grasp to have a discussion about Bloom. Without quoting every section of the article, here is a summary of the turn four rule as I understand it. The DCI’s other primary goal for Modern is to not have Tier 1 or high-end Tier 2 decks that win on turn three (or earlier) in 24%-30% of games. Note the percentage range comes from an analysis conducted in that article, one I’ll touch on again today. More conservatively, it includes decks winning pre-turn four 17%-30% of the time, but I focus on the upper-end because that’s where Storm fell when Seething Song took the ban axe. The key to remember is this: the turn four rule includes both the consistency of a pre-turn-four win and the tiering of that deck. Most Modern commentators and players forget this second piece or willfully ignore it. Also notice the definition doesn’t mention language around “warping” the metagame, being “unfun”, or being “too hard to disrupt”. All of this is either subsumed in the other two definitions, or doesn’t even matter at all. With this definition in mind, we can move on to Amulet Bloom and how it violates both aspects of the turn four rule. We know there are two components to the turn four rule: a deck’s tiering and a deck’s win-turn consistency. I’m going to start with Bloom’s “top-tier” status because it goes under-discussed in most Modern conversations. Wizards also opened its Song ban piece with a discussion of Storm’s metagame standings, so it’s worth doing the same today. Since the format’s birth, Wizards has banned three cards from three separate decks for violating the turn four rule. This doesn’t count the initial wave of bannings, which were conducted based on spurious Community Cup-based results, or on no results at all. As such, all three of the post-Pro Tour Philadelphia decks were necessarily considered top-tier at the time one of their pieces got banned. This is our starting point. If we are to accuse Amulet Bloom of being top-tier , we need to do so in comparison to these other decks. This ensures we are comparing apples to apples (turn four violators to turn four violators) and not apples to oranges (turn four violators to random top-tier decks like Jund and Twin). The first two of our three decks came out of Pro Tour Philadelphia: Shoal Infect and UR Storm. Blazing Shoal and Rite of Flame both got the DCI axe because their home-decks enjoyed excessive metagame shares throughout the tournament. Our third turn four violator was, of course, the infamous UR Seething Song/Epic Experiment Storm from 2012-2013. Wizards cited these decks’ tierings in all the updates, most notably the Song announcement. The table below shows different metagame shares in different metagame segments for each of the three decks. Some of the numbers are gathered from the respective ban articles. Others are calculated from Grand Prix/Pro Tour Day 2 listings, along with Top 8/16 standings. Taken together, these stats show us the range of numbers that constitute “top-tier” with regard to banlist decisions. Outside of 2012-2013 Storm’s MTGO prevalence, these are relatively modest percentages for our top-tier, turn four rule offenders. All of their 18+ point shares are in the 4%-6% range, which is right where we Modern Nexites would put a lot of high Tier 2 or low Tier 1 contenders. Their Top 8 and Top 16 performances are also quite close but, somewhat surprisingly, not too excessive. There are no 28% Abzans to speak of. Of course, Shoal Infect and Rite of Flame Storm were only around for a single tournament, so there’s a small-N issue of extrapolation at play in these numbers. Even so, the Shoal Infect and Rite Storm numbers are repeated in the Song Storm case, which suggests they are consistent even if we add more events to the equation. Now let’s drop Amulet Bloom into our table and see where the newcomer stands. By all tournament metrics, Bloom lines up very closely with the other decks. Its Day 2 percentage and 18+ Points shares are perfectly matched with the earlier turn four rule violators. Bloom doesn’t have the same MTGO numbers as UR Song Storm, but it more than compensates for this dearth with significantly more T8 and T16 finishes. I added a pair of columns for the SCG Opens and Invitationals (it’s unclear how Wizards weighs them but they surely take note), where Bloom also distinguishes itself as a major player. In all these categories, Amulet Bloom either aligns with each of its predecessors, or makes up for a small difference in one area with a huge gain in another. These prevalence-based numbers allow us to clearly identify the combo strategy as a “top-tier” Modern option, which triggers the first prerequisite of the turn four rule. As mentioned in the turn four rule article, and as hinted at earlier today, it doesn’t matter that other Modern decks are also top-tier (e.g. Twin, Affinity, Jund, Burn, etc.). Those decks aren’t also tripping the next step of the turn four rule, i.e. the consistent T2-T3 win, so the comparison is meaningless. All that matters is that Amulet Bloom’s tiering is comparable to the other turn four violators, which the table above clearly shows. Of course, turn four rule breakers aren’t only top-tier. They are also consistently winning before the turn four cutoff, which is yet another measure Amulet Bloom qualifies on. Unfortunately, Wizards does not release this kind of win-rate information. This has forced Modern aficionados to estimate Bloom’s win-turn percentage based on anecdotal observations or goldfish games. The Seething Song ban update suggests Wizards was looking at something more concrete, namely the real data in real games. In that article, Wizards said they were “looking at the results of games”, which points to some kind of MTGO, Grand Prix, and/or Pro Tour analysis to determine how frequently Storm was winning early. If Wizards truly uses this as their standard, we also need to look at real games to see if Bloom is meeting the turn four rule requirements. First, we need to determine Storm’s pre-turn four win-rate so we have a point of reference for Amulet Bloom. For both decks, I watched replays from almost a dozen events during the decks’ height of success. For Bloom, this meant starting the sample later in the year, after the deck was a known entity and when people were better at beating it and preparing for it. This resulted in a sample of about 30 games each for both Song Storm and Amulet Bloom, comprising roughly 15 matches at the Grand Prix, Pro Tour, and SCG Open/Invitational level. To account for a lower N, I bootstrapped each of the samples in 10,000 resamples, giving us both an average over the resamplings and a margin of error around that average. This lets us estimate pre-turn four win-rates for both Storm and Bloom in the same kinds of games Wizards likely considers in its own decision making. As a few important notes, the samples do not include matches by known deck-stackers. They also only account for actual kills or scoops by an opponent, but not situations where a turn two or three play led to an insurmountable advantage. Wizards likely looks at matches where a game “ends”, so a forfeit is part of that but a strong board position is not. I repeated a similar analysis looking at replays of a known Amulet Bloom player on MTGO. Analyzing around 70 games spanning 30-some matches, I found the following range for Amulet Bloom’s pre-turn four wins. Stated another way, Storm won on turn two or turn three in 25% of the total coverage games, but its “true” range is anywhere between 17% and 33%. For Amulet Bloom, it had the pre-turn four win in 23% of matches on camera, grouped around the 15% and 30% band. On MTGO, the deck averaged 23% in the sample, spread in the 17% to 29% range. It doesn’t take a statistician to see all these ranges are virtually the same. Although Bloom appears to be winning slightly less frequently than Storm (as seen in the average, high, and low values) there is no real statistical difference between their net rates. Amulet Bloom’s and Storm’s rates are about as different as a coin flipping heads 48/100 times and another going 52/100: the perceived difference is just a matter of variance. Statistics aside, this means the decks are winning at effectively the same rate, which is bad news for the Amulet Bloom pilots who attested their deck was actually slower than the old Seething Song combo. Naturally, all of these methods have limitations. We still are only looking at less than 150 games, spread between around 10 players in total. Although bootstrapping helps address the N, if the samples are skewed towards high-skill players to begin with, even the resample might not capture the run-of-the-mill Bloom player and their performance. These samples are also mute to the differences in Game 1 versus Games 2-3 rates, and it’s possible Wizards separates out those categories when assessing a deck’s consistency. Despite these limitations, the overall evidence suggests Bloom breaks the turn four rule on both of its critical counts. It’s top-tier by the same measures as seen in Rite Storm, Shoal Infect, and Song Storm. It’s also winning on turns two or three at the same rate as the Seething Song list. Coupled with the mountain of qualitative and anecdotal evidence, all of this points to Amulet Bloom being a legitimate turn four rule offender, one that Wizards will almost surely act against on the 18th. Last Call for Amulet Bloom? I’ve disclaimed this before and I’ll disclaim it again: it’s entirely possible Wizards doesn’t follow this line of analysis when Monday rolls around. If that happens, I’d definitely want to see where this methodology went wrong. Admitting that possibility, I also think it is incredibly unlikely. The historical precedent and the current data strongly point to Amulet Bloom being a real violator, and I expect Wizards to act on that next week. We still need to tackle the Primeval Titan lurking in the corner: knowing the deck’s violations, what specific card should get banned from Amulet Bloom? I was initially going to write this up today, but it meant repeating about half of this article in tomorrow’s banlist prediction piece. Rather than write this all out again I’m bouncing that to tomorrow. Spoiler alert: both Summer Bloom and Amulet of Vigor will feature heavily in the “Bannings” section. What do you think about the different numbers presented today? Are there any questions left unanswered or points I should clarify? Do you have any other considerations we should take into account when aiming at Amulet Bloom? One thing I didn’t get to include was a comparison to and an analysis of Infect, another possible turn four rule violator, and I’m sure some of you have ideas around that deck. Bring your responses down to the comments and join me tomorrow when I give my banlist predictions for January 18! Correction (1/12): An earlier version of the article incorrect attributed a reddit quote to Bobby Fortanely instead of Bill Comminos. Finally! This article has been hyped almost every day for the last week. This was a compelling case, though I was disappointed that I needed to read nearly half the article to get to the quantitative section. The statistical analysis sets this site apart from the others, so I’d rather have seen a smaller section devoted to the citations of other authors and giving shorter tl;dr’s of this site’s own articles. I’m curious about the win percentages against the observed archetypes and reasons why those decks won. Can midrange decks only beat it if they have a bad draw? Do blue decks need to aggressively mulligan for spell snare? How many players lost to their inability to play the deck (pacting incorrectly, e.g.)? I was a bit worried about that lead-in myself during edits, but hey, can’t blame a guy for building it up within the article! Although I think the bootstrapped samples are good for estimating win-turn percentages overall, I don’t think they are great for guessing matchup win-turn percentages. We’d probably want more data to do that, but I suspect midrange really struggles in G2-G3 regardless of how G1 goes down. Really liked this article, but will echo what JB said – a lot of fluff before getting to the meat. But as you say, no harm in talking it up! I’m amazed at that Turn 2-3 win percentage, and would be surprised if that held true on a larger sample. To back that up (in a way), I played a 6-round event and cut to top 8 on Sunday, going 4-0-2 in the swiss and loosing in the semis. Although the match-ups dictated this somewhat, my quickest win of the day was actually Turn 5 (I didn’t drop a game in the swiss or quarters, so it wasn’t like my slower kills were detrimental, just that I was violating Turn 4 rules). Am I right in thinking you watched 15 games from stream and 15 games from MTGO? In that case, if you add another 6 to the list (I know this isn’t a practical thing to do because a) I could be making all this up and b) I’m no pro), but the figures would change be another 3-4%. Anyway, this was the kinda data I’ve been waiting for, and (once I got to it :P) it was very useful to see. Unfortunately for me, I fully expect your predictions to be right, and its just feels like a case of what gets banned, not if. I was originally dead against Amulet bloom banning. I simply thought it didn’t have enough tops to warrant a banning. Honestly what doesn’t make Amulet Bloom so dangerous isn’t the speed it kills (albeit the speed definitely doesn’t help its case and decks like Twin isn’t that much slower honestly). It is the grind game it can play. Titan -bounce-west- for another pact is just sick. I am still against it being banned though. This is because it is both a low budget and a high skill ceiling and floor deck; a combo not easily found in Modern. Its hard to even argue that a deck like twin is SO much more interactive. T1: Visions T2: Remand T3: Exarch T4: twin. If decks are being banned because they are subjectively ‘unfun’ to play against. Why isn’t Ensnaring Bridge decks on the chopping block? Remember they have topped too! Just ranting a little bit! I know you are just ranting, but I want to point out that this argument was based on Wizard’s turn four rule and not the subjectivity of fun or unfun. “The key to remember is this: the turn four rule includes both the consistency of a pre-turn-four win and the tiering of that deck. Most Modern commentators and players forget this second piece or willfully ignore it. Also notice the definition doesn’t mention language around “warping” the metagame, being “unfun”, or being “too hard to disrupt”. All of this is either subsumed in the other two definitions, or doesn’t even matter at all. Nice! Just seems like the logical followup to the turn 4 article – we could already see from that article and from the nexus’ front page tier 1/tier 2 list that bloom would count as “top tier” based on metagame share – the question was really about the frequency of early wins. One thing you could have included was how often bloom wins on turn 2 – there was some question of if it would be more egregious to win on turn 2 and thus be subject to a lower threshold. 23% pre-t4 is enough to cement the case either way, but you know – of that 23% how many were actually t2 wins? In Bloom’s case, very few of the wins were T2 instead of T3. Then again, in Storm’s case, 1 or 0 of the sampled games was T2 and not T3, so it might not matter too much as a point of comparison. Maybe more interesting if we considered Infect too, a deck definitely capable of T2 wins. Thanks for the great article. Your vast knowledge of the subject (Modern in general) and dedication make you an invaluable contributor to the community. Whereas a T2 Hive Mind can be answered ONLY by countermagic (and even Remand, Modern’s ubiquitous T2 counterspell, is next to useless in this case) a T2 Primeval Titan, not matter how many more Titans follow, is in no way comparable to a T2 win and can be easily interacted with from multiple angles. I hope you have anticipated me on this argument and I would be very interested in discussing this matter tomorrow’s article’s comments. From my personal experience, the turn 2/3 Hive Mind is, what makes the deck the real offender since Hive Mind ignores most of the answers in the format, is difficult to disrupt and wins on the spot. Turn 2/3 Titan is pretty similar to what Tron does (and needs similar answers) and therefore should be treated that way. Is it powerful? Yes. Is it ban worthy? Not as long as Turn 3 Karn/ Wurmcoil is a “fine” strategy. Therefore I think Hive Mind should go, if something needs to be banned from Amulet Bloom. But it will not happen, Wizards just kill decks and ban big mana. As always. to be fair, the main ban targets are amulet of vigor/summer bloom. those are the reasons we can have turn two titan or turn two hive mind. both are egregious ways to win. the issue at hand is not whether they are winning with a titan or a hive mind, but the fact they do so on turn two or three. Another important variable in the analysis. Winning before t4 23% of the time… how much of that % is hive mind vs titan? If banning hive mind drops the pre-t4 win down to 10% or less we may be down into acceptable territory. If it just drops it to 18% or even 15% we may be back here in a year banning bloom anyways (see also: bloodbraid elf into deathrite shaman ban error). I’ll be talking about Hive Mind in tomorrow’s article. It’s not an impossible ban. I just don’t think it fits the “ban the ritual” model we’ve seen in past decisions. I wouldn’t be blown away if it got banned, but I also wouldn’t gamble on it. A ban of Summer Bloom seems by far the most probable to me. “Ban the ritual” is quite the way they chose in the past and could let the deck survive under some kind of form. But what about a Tolaria West ban? Since even “Ban the tutor” could be a fine policy. I’d say “ban the transgressor” is the most logical policy. But again, I doubt it will happen. Hive mind will remain, bloom will die. Strong article, and I’m glad you have taken your time and collected data of a sufficient sample size to make these claims definitively. I’m a bit disappointed that it’s come to this (T2 kills aside, Bloom was an enjoyable foe to match wits against), but this data makes a very convincing case regarding Bloom basically being Seething Song Storm risen anew, and we know how that story ended. I’m not going to trumpet for any bans myself, but given the data you have presented, I will not be shocked if a piece is taken away from it. Really nice article. I think Bloom gonna be hurted someway. Maybe Amulet would be too hard, but something must be done here. btw, I’m testing an UR Tempo deck with delver + storchaser mage. Its working so well by now on testing. When we will see a new one from yours? Hive Mind is a possible ban, but I don’t see it fitting the other bans Wizards has fired against the deck. Bloom or Amulet seem much likelier in my opinion. maybe Wotc is merciful and will just ban Slayer’s Stronghold. Should slow down the deck enough for modern meta. These kind of super niche bans aren’t Wizards’ style, at least if history sets any precedent. Wizards tends to be fairly decisive in its T4 rule violator bans, which points to Amulet, Bloom, or maaaybe Hive Mind but the latter seems extra unlikely. Great article, thanks Sheridan. As a bad amulet bloom player I know I was never close to 20% wins before T4, so the data genuinely surprises me. Is it possible that including games won by concession is skewing your results too high? In my experience on MTGO, people were often way too quick to concede to a T3 titan, are you able to see how much that affected your sample? I think it might be skewing MTGO numbers, but it wasn’t a factor in the coverage numbers. Given how similar those numbers are, I am inclined to believe the deck really is in that range, although we could maybe expand it further to be super conservative to the 12%-35% range. I just didn’t give those numbers because they are a bit too broad to be meaningful, and they are unnecessarily conservative. I expected this supposedly definitive statistical analysis to be more rigorous. A Chris VanMeter article and a SCG newsletter are not meaningful arguments or evidence for a particular outcome, and the other sources you cite are from after the decision would have been made. I’m not convinced that this piece has more or better quantitative data behind it than their ‘subjective’ opinions and predictions. 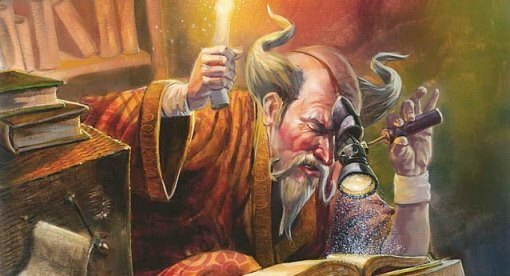 In the linked article about the turn four rule, you draw conclusions about 2013 Storm’s (the constant references to Epic Experiment are misleading: Experiment was played by some of the Minnesota players for a few events, but Ruel’s GP T8 deck as well as most MTGO lists didn’t feature it) pre-T4 win percentage and argue that this is the threshold for what’s considered acceptable. You don’t show that Wizards was using a similar data set or that their measure of ‘consistency’ is based on data at all. Their stated justification for banning Seething Song isn’t reassuring on that front: less than 4% of the 6-4+ decks at PT RTR, a single GP Top 8, and a presence on Magic Online that was heavily warped by it being the cheapest deck by far. It also doesn’t make much sense to invoke the metagame share of PT Philly decks: those cards weren’t banned based on their specific performance at that event, but out of fear that they would make up a much larger metagame share if they remained in the format (in addition to the T4 principle). I’d also like to see more discussion of what a ‘pre-T4 kill’ means in this context. When Storm is casting a lethal Grapeshot or Shoal is hitting you for 10+ poison, the line is clear; the same goes for Hive Mind. With Primeval Titan, it’s murky: an Amulet-fuelled Titan on T2 will kill before T4 unless the opponent has removal, but if it gets to attack once the game is surely lost. Without Amulet, T2 Summer Bloom into T3 Primeval Titan often effectively ends the game, but the actual finishing blow doesn’t come for a few turns. On those terms, the stats might underestimate the frequency of the deck’s nut draws. 1. I gave a ton of disclaimers on how to treat qualitative evidence like this, and it’s mostly given as a framing for everything else than a deciding datapoint. Those were given at the end of the qualitative section and at the beginning, so I’m really not sure why you think I’m using them as “meaningful arguments”. 2. Experiment was used a number of times at GP Chicago and subsequent events, not to mention on MTGO. It is presented as one of the two types of Storm that got Song banned. 3. As I wrote in the article, they are looking at “results of games”, which I interpret to mean real results in real games. It’s possible they aren’t using GP/PT/MTGO numbers, but if they aren’t, I really don’t know what else they would be using. I’m comfortable assuming they use this data because the alternative is that they are using internal test data or not using it at all. I like to assume they are more rigorous than that. Even if they aren’t, I will certainly try to be just to put actual numbers on the deck and hope they read the article. 4. You can’t assume PT Philly cards were banned because of a fear they would become top-tier. None of the evidence suggests this and it seems to be nothing more than speculation. The T4 rule is the only thing cited, and great emphasis was placed on the “top-tier” piece in that article. 5. Virtual kills are tricky, because every deck has them and we have no idea how Wizards treats them. As I said in the article, I table those because it’s too much speculation for us. I’m fine assuming Wizards reviews real results to determine a win-rate instead of just guessing at it. I’m not fine assuming a definition of virtual wins. I’m not one to ever comment on articles but the fantastic work I’ve seen on your site has compelled me. Just wanted to say I absolutely love the analysis you’re doing here. I think magic players have a tendency to nit-pick over arbitrary details and are contrarian by nature, but to speak objectively this is some of the most thorough analysis I’ve seen anywhere in the magic community. I found this site only a couple weeks ago and am very glad I did, I now check it for content daily. Thank you for all the effort I’m certain this took and keep up the good work! The only problem I see (which might be huge) is that most of the time when an amulet bloom player makes it onto coverage they are doing well, and that coincides with when most players aren’t packing enough hate for both bloom and tron. Just like other strategies, people need to make sure they have main/sideboard hate for the “Land” decks of the format. Throwing a simple ghost quarter into the mix can throw those early turn wins off by more than enough, not including the times YOU win if they can no longer pay for a pact lol. To try and only compile data on whether a deck breaks the t4 rule when it is most advantaged (camera time, when hate is typically lower, and people will have less interaction with it) doesn’t really help make a case for banning. Like most powerful decks in our format, preparation is key to beating them. Last point, if bloom was truly overpowered and that consistent, it would make up a much higher % of our metagame share. We can’t try and blame it on a “learning curve”. We can’t blame it on the price (cheap, real competitive deck). Fear that it will be banned in the future. Why can’t we blame it on either of those things? Because people are willing to do anything when it comes to winning, whether that’s learning something new, or spending some cash. People go out and try and play the deck every time it does well at a big event. Is it that they somehow didn’t spend enough time learning the deck that causes them to lose? Maybe? Or maybe its the fact that their opponents remember the deck exists and suddenly start packing just a few more hate cards each round. There’s a reason that when amulet bloom does well we don’t see a repeat, even when in the hands of a pro… the deck is simply to fragile and inconsistent to go up against proper hate over 9 rounds of a tournament. Amulet bloom is in my top 3 favorite decks. It’s like affinity of old, when people forget about it, prepare to win. It is sad to see the amount of sheeple that just want the deck banned so apparently 30 games is enough to make a judgment. But alas, I must say that I think Hive Mind is the biggest offender along with slayers stronghold. Why? Because those two cards actually ARE THE REASON the deck wins before turn 4, which evidence shows it doesn’t do that consistently. Hive mind is really hard to interact with and a large percentage of the time when it resolves you are pretty much screwed and even if you have an answer like natures claim or even a pridemage on the field you can still lose. So take that out of the deck and WOWzers, I guess that solves the insta-win feature of the deck. Slayers stronghold is the second and probably biggest reason why the deck is so strong, Why? because if amulet plays one titan with its amulet on the field, it can attack right away, netting basically another free way to find another titan. If the original titan doesn’t die, the very next turn comes down another titan with haste and they can give either or double strike. So what is so strong is the fact that if everything went well and no removal from an opponent, you just got 3 titan attacks in 2 consecutive turns and your titan received vigilance so it is also able to play defense. If we take out stronghold this eliminates this from happening, effectively taking away the bane-esque back-breaking play. Now I completely agree with the comment made in regards to tron. How is a turn 3 planeswalker going up to 10 counters or exiling any permanent any less oppressive than turn 3 primetime? especially without stronghold? Not exactly like heroes downfall or dreadbore is a realistic card to be competitive with. Not to mention how many people misplay all the time vs amulet bloom? The reason they misplay is they A. lack preparation and knowledge B. Most players don’t know how to interact with the stack anymore because wizards is attaching spells to creatures and basically just making it way to easy for people. Not to mention with these newest eldrazi you get frickin cast triggers?? making it even more of a braindead way to play. Ok enough with that rant.. but on to the other issue I have. Seething song and summer bloom are completely different cards. Seething song by itself, doesn’t need any other cards, it will always add 5 mana for one card. 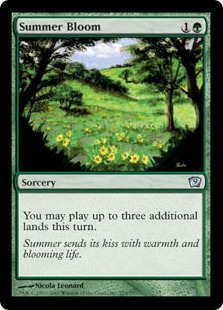 Summer bloom needs a bounceland and an amulet on the field to amount the six mana necessary, or it needs 3 other lands in hand to get it’s full use. So in scenario two, you play summer bloom with no amulet on the field and actually dump 3 lands on the field you essentially have what? 2 cards in hand at most left? Now yes, scenario 1 with amulet and bounceland is the strong and most popular line of play since it leads to the explosive starts but like I said, take away the stronghold and the hive mind and you take away the turn 4 problem while leaving the deck intact. Also storm while a skill intensive deck, is not a good mechanic on magic cards. The way the decks are designed are completely different and they use their rituals differently. Storm is very hard to interact with, and when its “going off” you really can’t do anything about it minus mindbreak trap or flusterstorm and the izzet overloaded counterspell. Now black has tons of discard but if you play all discard and no pressure, storm will just redraw the cards back. If you happen to not have the counterspell which can handle it then you are left basically guessing which ritual counter. Now I love watching legacy storm because tendrills is so fun and strong but the fact is the deck is completely un-interactive and since there is no FoW in modern, you really need either mindbreak trap, 4 discard spells in the first 3 turns or for the deck itself to fizzle. Also add to the fact the deck is extremely cheap makes it very easy to get out of hand in terms of format health. Storm vs Storm, who will draw first? Even Cedric Phillips will be hard pressed to make that fun to watch. So while making the comparison of summer bloom being banned because of the ritual in seething song banned from storm is logical in some contexts, I am proposing that they are in fact totally opposite and help their decks operate in different ways if you look at how the decks are constructed and how the cards themselves are designed. Also, I am not attacking the author of this article or anyone in particular. I am glad someone took their time to go and find some data and propose the hot topic of “bloom banning” since it has been the topic of every other modern article in one way shape or form. Now I will also add this to complement the authors words because alot of this controversy is around the cloudy “turn 4 rule.” (I am really glad you brought this to everyones attention at how poorly Wizards explanation of this and their obvious odd ways of reinforcing this is). I am not for or against the turn 4 rule, but for the sake of taking a stand I will say that Wizards should take a a stand saying that no deck should be able to win before turn 4. If a deck is capable, we will look at how it is doing so and determine that if the deck does so and is unable to be interacted with by every color and/or multiple cards (that they can clearly list) then it will be put on a “ban notice” that we will announce. If the deck continues to warp the meta by holding over 15% of the meta for 12 months and can clearly not be interacted with by multiple cards and colors, then it is highly likely that the deck could be banned. At least by doing this we can get insight to what the hell they are doing in their smoke filled rooms when they make these ban announcements. Burn and infect and affinity would a few examples of the decks that can win before turn 4, but each color in magic has multiple ways of interacting and disrupting those decks game plans. If they ban bloom, they should definitely ban Hive Mind. It’s the only card in the deck, that actually does kill before turn 4 “consistently” with a good hand. Banning Amulet, Titan or Bloom would just be stupid. None of these cards are overpowered or violate any modern rules. Yes Titan Bloom is strong, has inevitability and and is pretty much unstoppable once Primeval Titan resolves and survives, but honestly, if you let it, it’s your fault. Hive Mind Pact Turn two is another story, but even that is weak to hand disruption.